Living in an NYC, I'm envious of suburban front yard holiday displays. Strings of lights, candles in the windows, a wreath on the front door - I want these things! But, the element I cherish most is the tacky lawn prop. From gaudy candy canes to illuminated Santas, these are the reasons I want to be a suburban dude. 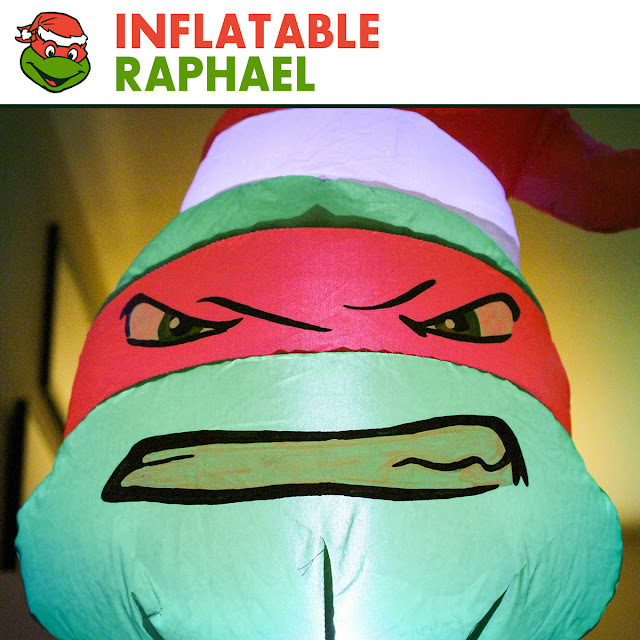 That dream is infinitely amplified when an inflatable TMNT Raphael lawn decoration is a possibility. This big bag of air is awesome. Inflated, Raphael stands at about 5 feet tall. An impressive height for a suburban lawn, even more impressive inside a dinky NYC apartment. A red Santa hat for the red bandana-wearing Turtle is on the money. But, the dude still could use more holiday cheer. 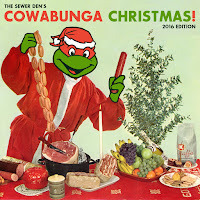 The massive pizza slice in his hands is fun, but lacks a festive punch. If it was topped with candy canes and gingerbread men, then that piece of pie would make me merry. Raphael always gets branded as the hot-headed dude in a bad mood. That's fine for a plot within an episode, but on a lawn full of Christmas decor? Make this mutant smile! Those who have the intention of putting a 5 foot Turtle on their property are no grumps. I have an inflatable Michelangelo from a few years ago. Let's hope one day I'll have the entire fearsome four, fighting the Foot Clan with festive, inflated air. If nothing else, you can use him as home security! Sewer Security. Keeping people safe since 1984.